“Foot” and “Leg” had Christmas dinner with us some years ago. 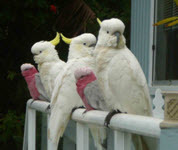 They waited on the balcony rail for a hand-out of seeds. Nature is unkind to those who are not fit and able. The story of “Foot” and “Leg” is a sad yet encouraging one. “Foot” broke his foot some years ago and walks clumsily. 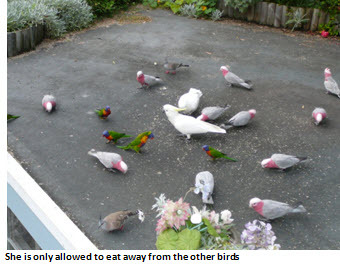 Because he was ‘different’ the other galahs were not kind to him and let him feed only when they had had enough. 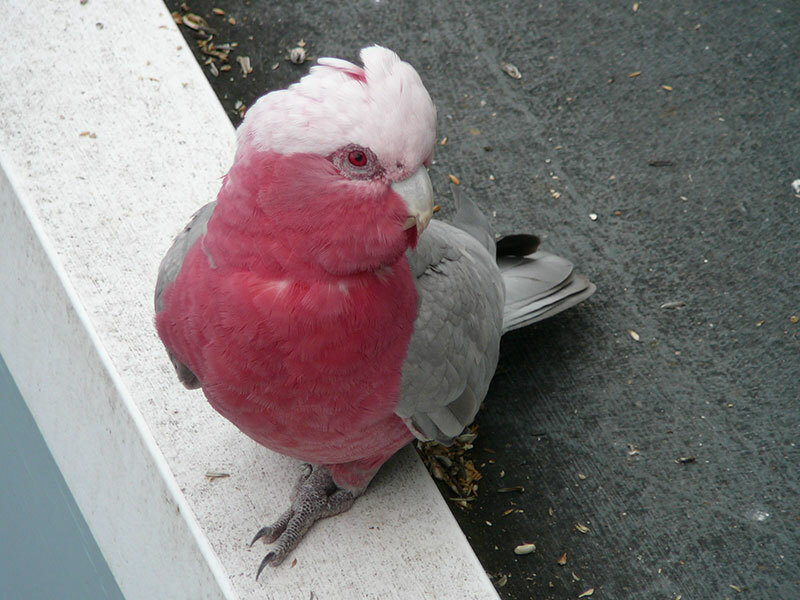 One day he met a female galah with an injured leg. They paired up and started producing young each year. Then “Foot” was found at the bottom of my road. His wing was broken as a result of a gunshot. One pellet was too deeply embedded in his breast muscle to remove. I cared for him in a cockie cage on the balcony until he was able to fly once again, hoping that the lead from the embedded pellet would not poison him. “Leg” may also have suffered the same fate from the gun wielding maniac and walks mostly sideways. Her hip seems to be arthritic and from time to time she is unable to use one leg when landing. I letterbox dropped their story to everyone in the neighborhood with a plea to dob in the gun toting maniac. No one was dobbed in but the shooting stopped, never to start again. In time “Leg” become more and more lame then she stopped visiting. “Foot” didn’t waste too much time though. He fell deeply in love with a very young female (from last year’s crop of young) and they visited three times a day. The female is beautiful – pale pink and quiet. A year or so later “Leg” came back to visit again. She could only land by crashing to the ground, balanced on one leg with a wing spread out. She looked so pathetic but was still able to fly well. After a while she arrived with a new mate, a very pushy male who knocks so hard on the window that he is in danger of breaking it. She now only has one leg, the injured one appears to have dropped off. She has learned to land on one leg and even hops along my shiny round balcony rail now. The other galahs are still a bit bossy and she is only allowed to eat seeds from the outer edges of the pile. She usually comes with her mate for their feed at a slightly different time to the rest of the flock. But, she is well and looks great. And each year brings her latest baby to show it to us. “Foot” has not been seen again.